They say the sound part comes first. 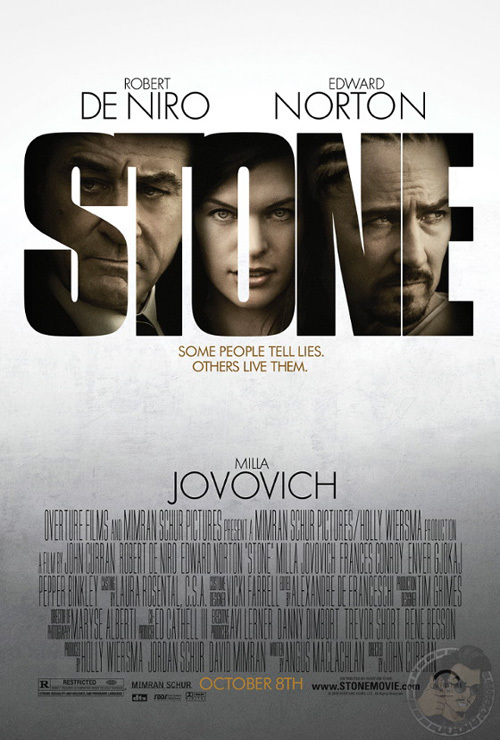 An uneven but involving straight-to-DVD (in the UK) release starring Edward Norton, Robert De Niro and Milla Jovovich. It starts off looking like it's going to be fairly predictable; Norton's convict asks wife Jovovich to entice parole officer De Niro into putting the case forward for his release. Certainly, the trailers sold it as a psychological thriller. In the end, it's more of a metaphysical drama, throwing up questions about God, morality and perception in a quite unexpected fashion. Much of the success of this is down to John Curran's direction and strangely gripping use of sound (which is integral to one of the plot strands). I really like Curran's previous The Painted Veil, and if this is not as successful it still marks him out as someone intent on plowing less usual furrows. Norton starts out screaming “transformative character part”, heavily accented with prison-issue cornrows, but the initial irritation of his character morphs into fascination. De Niro gives his best performance in a considerable time, even though there's nothing new being brought to the table. Jovovich is more one-note, but that's more due to the clearly delineated character she plays than her fault.